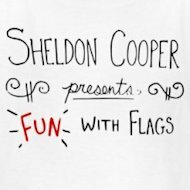 Sheldon Cooper Presents “Fun With Flags”: A YouTube Series of PodcastsThe other day I happened to be eating lunch and staring off out the window. While that may not seem important, it is. Most of the time, I like to be reading or doing something, while I’m eating. I completely understand that it’s probably better to not do this, but I often can’t help myself. Anyway, as I was sitting and just eating, an idea came to me. (Don’t you find that ideas come to you when you’re not thinking about them?) The idea, as the title of this post suggests, a web series from one of The Big Bang Theory’s main cast members: Sheldon Cooper.